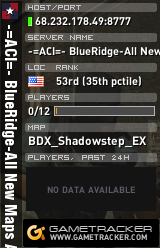 Subject says it all, I'm B.O.W.619, I hope to join Blue Ridge and have fun playing America's Army with everyone. Re: Just here to say hi. Welcome, join us on TeamSpeak and our AA:PG server to get to know us as well as us you. welcome to the blueridge forum!